The December issue of the UK's 'Easy Living' magazine lists many wonderful gift ideas for the holiday season including a terrific book first mentioned here on Lose That Girl back in July, "Important Artifacts..." by Leanne Shapton. The UK version features a different hued cover ~ red...perfect for Christmas ~ but the impact this novel brings is still unique & special. 'Important Artifacts and Personal Property from the Collection of Lenore Doolan and Harold Morris, Including Books, Street Fashion and Jewelery' -- not only beholds one of the longest titles ever encountered but also one of the quirkiest reason d'etre. You would be hard pressed to find a cooler storytelling technique. 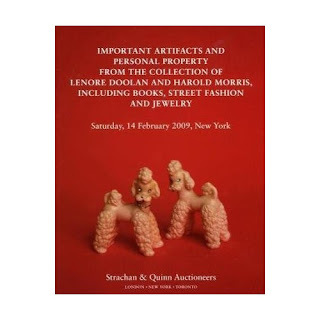 Focusing on a series of personal miscellany, kooky knickknacks & heartfelt notes once held privately by the fictional coupling of the aforementioned Lenore & Harold, 'Important Artifacts' is set up like a public auction catalogue. Much like when a famous person dies and their personal effects end up on view & purchase via wealthy auction houses, these items are laid bare upon the demise of Lenore & Harold's love. Photos of everyday random objects mingle within the pages, witnesses to the birth of Lenore & Harold's four year relationship, its passionate life & eventual death. A smashed cup, a smudged handwritten note, stolen salt & pepper shakers all gather to tell their part of this fantastic story. And here's where Shapton excels & really nails the whole relationship thing on its messy head. We all accumulate 'stuff' from daily personal interactions, from friends & lovers - inconsequential items that resonate with a feeling, with a memory related to person once (or still?) deemed special. A crumpled receipt cherished from a favourite eatery where you dined on your first date. A pressed flower remaining from a bouquet gifted by an ex. Even ticket stubs from a memorable concert -- we're all guilty of collecting such life keepsakes. Most objects in the hands of others not associated with their special-ness would just be seen as life clutter. What's a stolen salt shaker without its human context but a rogue table accessory? Suffice it to say, in the eyes and heart of the beholder, it's probably a token from a night to end all nights, full of passion, laughter and unbridled excitement. One person's trash is always another's beloved treasure...especially when wrapped in memories. I'm well & truly hooked. If you are too, check out Leanne Shapton speaking about her novel from her own perspective. You'll never regard your old relationship souvenirs in the same way again.